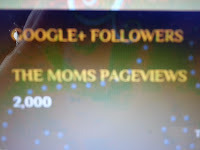 "The Moms" Hubby gives 2 thumbs up on 2,000 Pageviews today! We shall all celebrate! 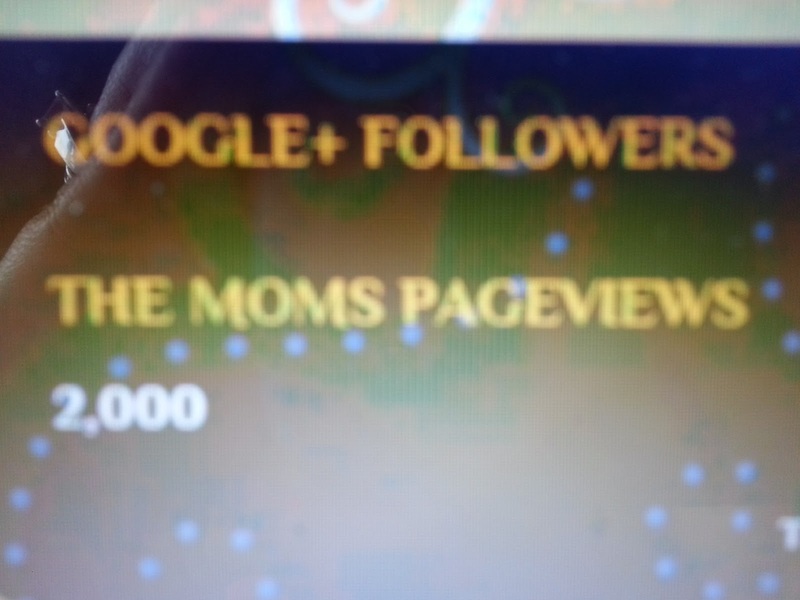 Thank You to all the unbelievable moms out there for contributing and/or sharing the encouraging word!!!!! Stay tuned for even more great news, tips and stories to come with The Moms Diet! Like a Diet; Get rid of the junk because the good is more fulfilling! "Always be the person that when someone does talk negative about you, others won't believe them anyway." We cannot control what others say and do but we can control our own actions. And how we act or react is what our children watch, observe and duplicate, the good, bad and the ugly. Its like you want to spray "PAM" Protection on your children every morning. You want words and hurt to slide right off of them and not effect them in anyway. That is exactly what we need to "show" our children and let go of negativity and let it slide right off us finding the cup is half full, never half empty. There is good in everyone. Forgiveness and saying "I'm sorry" is not about the other person winning, its about being honest with yourself and finding closure within. Don't accept words about others to others, accept the person you took the time to know from the start. One call. One call from a doctor, a friend, a parent, a sister, brother, the list is endless. A call that we fear of, a call that seems so unreal once its made. A call of cancer. I wanted to share these stories of people in my life that have made me take a look at embracing everyday because we never know what the next minute will bring. The Call of Cancer Posts will bring you tears of joy, sorrow and encouragement to those surviving, those that have survived and those that fought thru to the end. Please share these stories with others in hope of knowing that they are not alone when they receive that "one call of cancer". And please let me know if you have a story of your own that you'd like to share with others for encouragement, hope and wellness to all moms alike. This started off with me having a Michael's Craft Store coupon, a store sale and kids wanting to make a mess! And the family- finger- painting-at- home- art- museum began!!! My kids won't have little fingers forever! Create an outdoor movie in your own back yard! Ann, thanks so much for letting me share!! After coming across this beautiful piece of art :) clipped on my friends fridge, I just had to pass this on to all the parents out there that could use a visual for their "determined angels"! Pure brilliance in my book! Ann Dombroe found this on Pinterest and applied it at home with her beautiful girls! 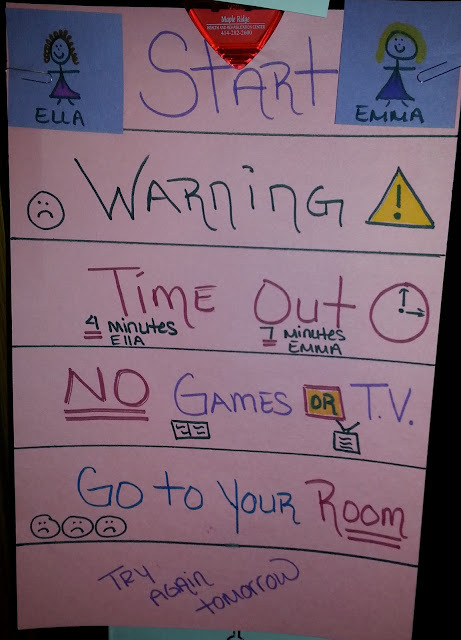 Ella (4) and Emma (7), do not even want to see their name & pictures drop down to a "warning" vs. when it was just a "verbal warning"! Now they SEE whats ahead if Mommy's words are not heard the first time. Ann says it is working like a charm and when it gets tested to the limit, she stands firm! If there is a party or fun event coming up on that day she'll cover up the "GO TO YOUR ROOM" Part with a "NO PARTY" slip... or whatever the name of the event is! So instead of just going to their room, their is no party that day either! Each day is a fresh new start with their names returning back to the top to "try again tommorow"... fair enough for me! The time out is decided on what their age is. Ann runs a pretty smooth ship at home and I can see why after I learned about her "strategy" ha,ha,ha,ha! Thank you so much Ann for sharing!! 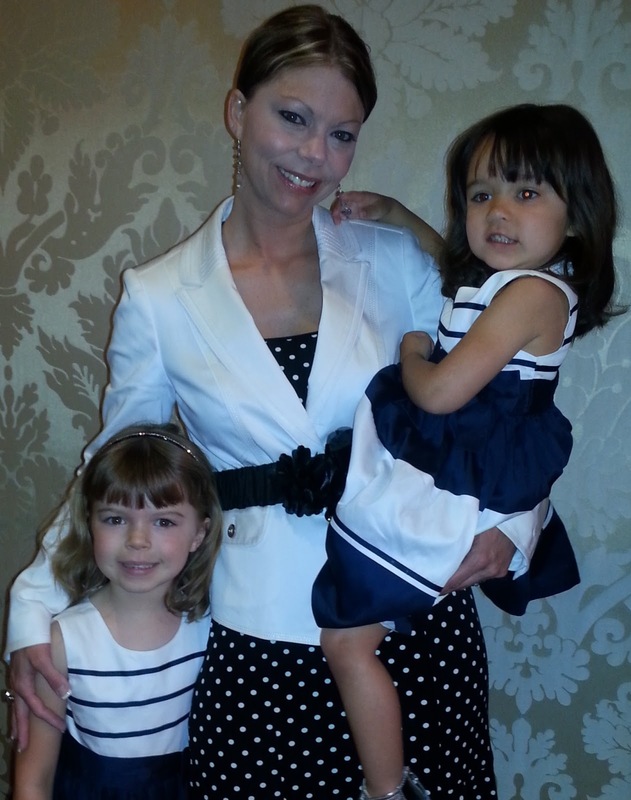 You, Ella, Emma and Thanh are a wonderful family with the biggest hearts helping so many others in so many ways! Thank you both for all you do and especially for being you! Comment below on ways you've implemented some rules at home or how this project has helped to do so! This past week I attended an amazing program honoring our country and all the service men and woman. Many of us also attended parades and firework shows, as well as red, white and blue celebrations with family and friends joining together for our American 4th of July Holiday. I always get such a chill in my body and a choked heart as we honor all that serve and all that have fallen while serving for our country. Freedom has a price and there are hero's in our everyday life that paid that price of freedom for all of us. 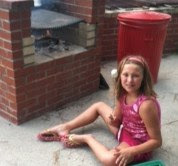 I'd like to thank Heather Eberle for sharing her camping trip with us! With her husband back home for a short time from military leave, together, they planned a total impromptu camping trip, spur of the moment and had one of their best trips yet! I hope this motivates you to get up and go wherever it may be just to have that special, memorable time with your family! "Hooray! It's Summer! What are we going to do today?" 16 days into this Summer season and I've been asked this common question 16 times already by my favorite crew of three; ages 8, 4 & 3! Again, no plan... YET... we start to pull it together! A couple phone calls, a packed bag of apparel & bedding, food gathered from the pantry & we were out the door in under 2 hours. Seriously, if you put your mind to it and grab some items from home, it CAN be done! The first call was to the RV Park to check availability on the grounds. And, the second call was to an RV rental company to house a roof over our heads. Jackpot! There's our plan! Both were available and deeply discounted because we were traveling on a weekday. The only requirement was for our truck to have a towing package with an appropriate 'braking system connection'. I'm certain there is a technical term for this, but REALLY?? 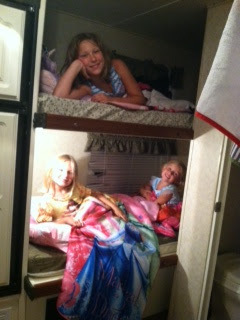 A camper/RV is really the way to go. You pay a flat rate to park your abode, plug in your power and hook-up water. Request a location closest to amenities such as restrooms & showers or beach/pool access routes. You will be thankful you did after a long day of playing, and for those quick potty runs! 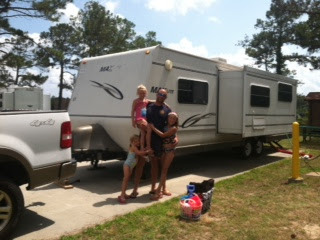 A home on wheels with Hubby and 3 girls! Next, we started packing. Swimsuits, towels, pajamas and a couple clean pairs of undergarments per person. A few toiletries: a bar of soap, shampoo, conditioner, and a hair brush. Sun tan lotion, aloe gel, bug spray and anti-itch cream are a MUST! And, a few random items, that you may or may not use: toilet paper, baby wipes, an umbrella, Citronella candles, chairs & a lighter. With everybody gathering their favorite item of bedding (1 pillow, fitted sheet & blanket per person) packing took us about 45 minutes to do. All apparel & bedding fit into one, large, sea green, United States Navy-issued bag. Then, we packed our cooler with waters, Gatorade, lunch meat, hot dogs & condiment packets of ketchup & mustard. You know, the ones you get a plethora of from fast food chains? Yes, I keep those for moments like these. You never know when you'll go camping on a whim and NEED these crucial condiment supplies! We made one quick store stop for the BYOB "adult" necessity. 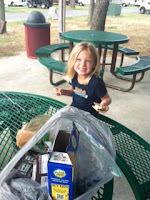 We filled a reusable grocery bag with plastic garbage bags, paper plates, plastic forks & knives, a paper towel roll, chips, hot dog buns and bread. 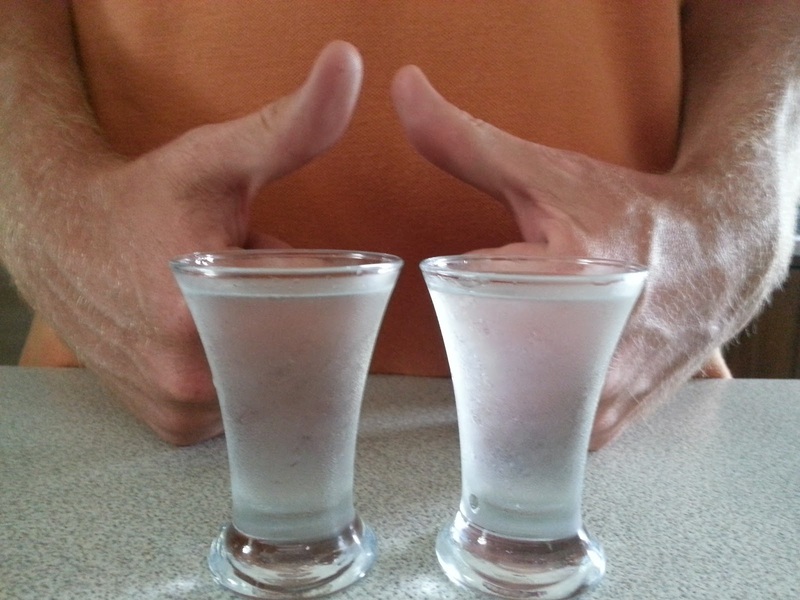 The best part of a camper's meal? The s'mores, of course! Graham crackers, chocolate bars & marshmallows. If you have fire pit sticks, great! Otherwise, hunt down fallen branches at the camp site. 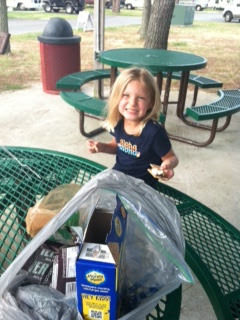 Such fun for little ones to seek their very own s'more maker! Finally, gear up the car and hit the road and make it a trip to remember! Thanks again Heather Eberle! This trip was very impressive for being a get up and go idea! Heather is one of the best hostesses I know when "just putting it together" for a great time with friends and family! She's not only my best friend but a great sister whom I'm lucky to share many of her fun "impromptu" adventures with! So I ask you Moms, whats your favorite "unplanned memory" that made a difference in your families life, an impromptu trip that you and the kids are still talking about, or one item you CANNOT camp without? Share with us your ideas and adventures below!